Thanks for a rare find from Linz, Pure Derek Hough is also featuring some BTS video of camera blocking. It features all of the dancers getting ready for the finale including some footage that what wasn’t featured on GMA. Also, you can preview a glimpse into the new issue of Annex Man Magazine which is featuring a new photo shoot with Derek….and let’s just say, I’ve never seen Derek be so edgy. The creativity behind this shoot is very Lady Gaga/Madonna/Vampire like in some of the pics. Way cool and high fashion at it’s finest. More at this link if interested!! JC Rubio of AfterBuzz TV has posted some “never seen before” backstage footage from the premiere of Dancing With The Stars Season 17. This is fun! Check it out! Hey, for those interested, a new Valerie Harper movie called “The Town That Came A-Courtin'” will be premiering on the UP channel at 7:00pm on January 19th, 2014. If you’d like to read about it, see IMDB.com. You can also see a poster at this link. Also, after Thanksgiving, People posted an interview with Tristan MacManus and Valerie Harper that was filmed after the finale of Dancing With The Stars. She gave an update on her health. I loved when she said, “What’s to complain about?” Note too that she’s planning to celebrate the holidays with her family and she’s not planning to look back, but, only looking forward. Below is more. She’s so amazing and so inspirational. Good news for TV Ratings for Dancing With The Stars. Our show moved up from 8th place during semi-finals week to 5th and 6th place during it’s Finale week. The viewership numbers may be a little down from last fall’s Season 15 Finale of 16.7 million, but, it was neck and neck with Season 16 finale ratings. 1. NFL Football Thanksgiving Special: Pittsburgh at Baltimore, NBC, 21.07 million. 2. “60 Minutes,” CBS, 18.09 million. 3. NFL Football: NY Giants at Washington, NBC, 17.75 million. 4. NFL Thursday Post-Game, Oakland at Dallas, CBS, 17.47 million. 5. “Dancing With the Stars Special” (Tuesday), ABC, 14.75 million. 6. “Dancing With the Stars,” ABC, 14.61 million. 7. NFL Football: San Francisco at Washington, ESPN, 13.16 million. 8. NFL Thanksgiving Pre-Kick, NBC, 12.67 million. 9. “NCIS: Los Angeles,” CBS, 12.32 million. 10. “The Walking Dead,” AMC, 12.05 million. 11. “Person of Interest,” CBS, 11.89 million. 12. NFL Pre-Kick, NBC, 11.71 million. 13. “The Voice,” NBC, 11.52 million. 14. “Castle,” ABC, 11.41 million. 15. “Rudolph the Red-Nose Reindeer,” CBS, 11.31 million. ABC Media Net is also reporting these ratings and numbers…. Building its numbers on night 1 of its 2-night season finale, ABC’s “Dancing with the Stars” was Monday’s most-watched entertainment show for the 5th week in a row. Bill Engvall was the next celebrity dancer eliminated from the competition. Growing week to week in Total Viewers (+6%) and Adults 18-49 (+10%), “DWTS” drew its biggest audience since its season premiere and scored a 9-week high with young adults – since 9/16/13 and 9/23/13, respectively. ABC finished as the dominant most-watched TV network on the final Tuesday of the November Sweep (+1.2 million over second-place CBS – 13.0 million vs. 11.8 million) and ranked No. 1 in Adults 18-49 (2.5/7-tied w/CBS). ABC’s “Dancing with the Stars” finale stood as Tuesday’s most-watched TV show by 20% over runner-up CBS’ “NCIS: LA” (14.8 million vs. 12.3 million from 9:00-10:00 p.m.) and “S.H.I.E.L.D.” was night’s No. 1 scripted series in Adults 18-49. From 9:00-11:00 p.m., the season finale of “Dancing with the Stars” made ABC the No. 1 network in the 2-hour time period with Total Viewers and key Women (W18-49/W25-54), while ranking as the top broadcaster with Kids 2-11. 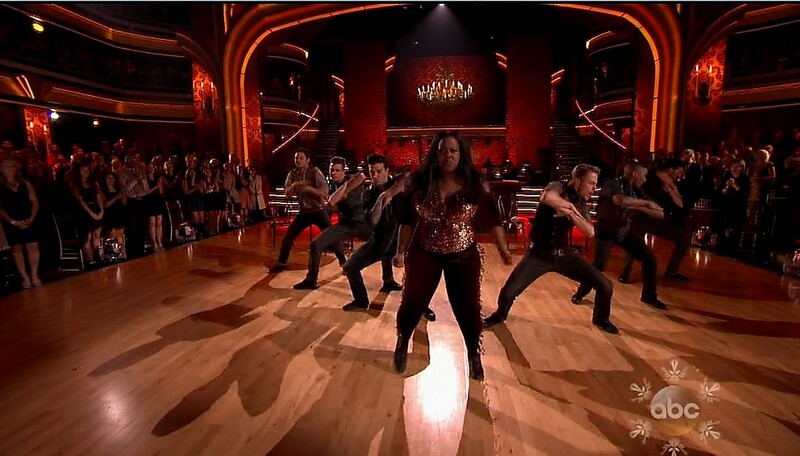 Dominating its final half-hour from 10:30-11:00 p.m., as Amber Riley won the coveted Mirror Ball Trophy, “Dancing” delivered 15.6 million viewers and a 2.6/8 in Adults 18-49 to lead its nearest competition (CBS’ “Person of Interest” = 11.8 million and 2.1/6) by 3.8 million viewers and by 24% in young adults. Let’s see if Heidi has something to add…. Heidi: Well, the “rank” means very little when it comes to ratings. Throw 15 football games up there and knock it out of the top 10 and that won’t hurt it as long as the same or more people are watching the show, if you know what I mean. The important points to come out of the above are that it is still beating the Voice in total viewer numbers AND it’s still growing week to week. Six percent growth from the semi-finals to the finals is nothing to sneeze at, for sure (take note, Maks fans). The finale (results show) was down from the all star season…but what do you expect when people get OUT of the habit of watching DWTS on Tuesday night?? Not to mention that the ALL Star Season was a bit of an anomaly. I think the producers were on crack when they thought that the ratings for that season were down because no one wants to see great dancing. Bull. Your show is aging, and TV viewership is falling across the board. You can’t look at it in a vacuum. All TV continues to sink in viewer number – except probably cable. People have more choices now. Looking at it very simply…this is where the Rank plays a part. How can DWTS STILL be Top 10 show while still falling in ratings season after season?? Simple…because ALL TV is falling season after season. If DWTS were the only show with declining viewer numbers, it would have fallen out of the Top 10 by now. As you can see, the season starts out very high and then drops consistently until week 5, when it starts inching it’s way back up again. If not for November 11th, it would show fairly consistent growth from a mid season low to the season finale. From what I can see, the only thing having a major impact on ratings was the pre-empting in Boston and Charlotte. Everything else falls on a very nice curve – very similar to curves shown when I graphed previous seasons. It appears that the theory that people want to watch bad dancing may not be true. How else do you explain that people tune in to the first show, then fall out until past the halfway point?? Be sure to read about some “backstage” details of the Dancing With The Stars finale at JC Rubio’s official site here. Below is some video too. This is too fun. THANKS JC!! As promised, PureDWTS Guest blogger and poet Lois is back with a commentary in wrapping up the season!! Anticipation was building to a fever pitch! Rumors were swirling! The announcement of the cast for Season 17 was fodder for Internet and water cooler chat! The nation was hungry to know the names of the brave celebrities who would be lacing up new dancing shoes! The smell of leather permeated the studios of DANCING WITH THE STARS! Shoes were waiting for twelve pairs of feet to fill them! Re-wind to September 4, GOOD MORNING AMERICA! Finally the new cast and their pro partners were announced! Each brave soul entering the studio to begin their dancing journey! PETA MURGATROYD and BRANT DAUGHERTY. I was familiar with many of the cast but not with a few. This is why I love this show every season. I am always pleasantly surprised by those I am not familiar with. I am pleasantly surprised by the growth of the celebrities on their dancing journey. I find each season fascinating! There are many learning opportunities by watching the show. From learning more about the celebrities to the dances we see. I would be fascinated to go behind the scenes! I would love to see how the juggernaut, the brains behind the show, puts it on every week. We did see some behind the scenes commentary. But, they should put on a comprehensive special allowing us to follow from the beginning to end of a show. What goes on behind what we see on the air? I would love to see a special with all of the dancing pros dancing together. And a special with exhibition dances by the dancing couples, no judges, no scoring. Just dances galore! Those specials would be music to my dancing lover’s heart! For Season 17, changes were made to the format of the show. The most notable was the elimination of the Tuesday night results show. I wondered how they could pack everything into a two-hour show that had been done in three hours in previous seasons. My feeling still is that the show seemed rushed. Am I correct in my feeling that the dances, at least in the beginning, were shorter in order to make them fit into less time? Tom Bergeron needed to keep the pace of the show by limiting comments from the judges, for example. He limited the teams from doing longer celebrations. I still think a Results Show is needed. Yes, towards the end of the season musical guests appeared again. But, I still love the musical guests that were on the Results Show every week. I loved the extras that had to be eliminated due to time restraints, such as more rehearsal footage, etc. I preferred the Skybox for the couples as opposed to the glitter benches. They seemed more restrained there. It seems more appropriate for them to be located away from the judges. Another thing that was limited by the two-hour time restraint were many more pro dances. I believe the show made up for that somewhat by the super-sized opening numbers. But I will take all the dancing I can get. I would love to see more pro dance numbers again. And, there were very few encore numbers. I loved seeing the encore numbers each Results Show. I hope the Results Show is reinstated for Season 18. I hope they keep the show on twice a year. I hope the show goes to Season 20 and beyond. I believe this show can be kept fresh by introducing things such as different type dances, like trio and fusion to name two of the ones introduced. The powers that be have done marvelous work so far. I expect they will continue to refresh the show. Questions brewed, most importantly, the voting. I was a bit confused at first how the show could only be one night. And how our votes could be factored in. There was a voting snafu which saved all of the couples into the next week. I had read of voters thinking their votes were cast for the wrong couples when they voted on Facebook. Or having phone issues, etc. Of course, each season there are those who feel the show is rigged. I will never, ever believe the show is rigged. People must keep voting. The modern technology used in voting is not foolproof. This season many talented dancers were eliminated, Elizabeth, Nicole, Christina, Brant. Some complained, which happens every season, that less talented dancers were saved. The debate will always be there, voting on popularity v. voting on who has improved the most, the best dancer. My opinion is just vote with your heart. There is no scientific formula, no right or wrong answer. There is actually fun in debates, but use common courtesy. We will never all agree on who has won the MIrror Ball Trophy. This season brought three guest judges, JULIANNE HOUGH, CHER, and the one, the only MAKSIM CHMERKOVSKIY! I thoroughly enjoyed the fresh perspectives they brought to the table. The judges are the brunt of much controversy. Are the scores too high, too low? I feel I am not in a position to judge them. It will be what it is. Is there a need to replace the judges, add a judge? Again, that is not for me decide. I will just say if the judges’ system isn’t really broken, why fix it? AMERICAN IDOL has tried judge after judge. Few of them have measured up to the originals. I would be remiss if I did not mention the astounding talents of every pro, teaching and the troupe! They are the backbone of the show. They make the dancers into what they become on their dancing journey! I am in awe of their talents! One central thing to remember. DANCING WITH THE STARS is first and foremost a sparkling entertainment extravaganza! I love the entire show! From the sequins to the costumes to HAROLD WHEELER’s orchestra to the commentaries from everyone. Thank you for everything you give to me! Season 17 is in the DANCING WITH THE STARS History Books! It was another season filled with the brilliance of the art of dancing! What more could we want? Season 18 is around the dancing bend! See you in the middle of March, 2014! Lois is back with not one, but, TWO poems in wrapping up Dancing With The Stars Season 17. She includes a “thank you” for reading her work as well. Enjoy and THANKS LOIS! A SEASON 17 SHOW-STOPPING FOUR-STAR REVUE! Another poem will be written, my gift from me just for you!